All I can say is what an interesting transmitter . To get started one has to install batteries and to do that all you do is gently pull at the top of the tab on the battery cover . Just a gentle pull outward and down and it should pop open . A lot of folk are going with 2s lipo packs but I have decided to stick with AA for now and see how things go . If you go the AA route you may find the transmitter beeping a voltage warning at you . So the first thing you need to do is go into the menu and change to voltage range for the low voltage warning . I changed mine to 4.6v . Press and hold the power ( on – off ) button till the transmitter starts , Takes about 2 seconds . Press and hold the menu button till you enter the radio set up menu . 3rd menu option is your battery range , I set mine to 4.6 – 8.4 volt . Then scroll down till you get to your alarms and set the alarm voltage for the battery , again I have gone with 4.6v . Once you have done that simply use the exit key to leave the menu . To create a model . Press the menu button quickly ( don’t hold it down ) Select an empty slot , and press the enter button . Press the enter button again to create a model . To move to the next page push the page button . A short press to move forward and a long press to move back . On this second page you can name your model and set your module and bind to receivers / models . Simply press the enter button to enter the function , then use the forward and back keys to select letters . If you want a capital letter just press and hold the enter button . After you have done this you can select the next letter in the name . To maintain a small letter just give the enter button a short press . Once your name is done just press the exit button . By default the radio is set to internal D16 , since there is no internal Tx module to work with we must select the external multi protocol module . First we need to disable the internal function . Highlight D16 and press the enter button , then press the back button to select off and press enter again . Move down the menu to external RF and highlight off . Press the enter button and then the forward button till you get multi and press enter again . Now the Tx is running the multi protocol module . Press the forward button so that the protocol is highlighted and press enter , now use the forward and back keys to select the protocol you wish to use , you may also need to set a sub protocol . Move down the menu till you get to Rx number and right next to that should be BND , short for Bind . Highlight the bind . To start bind you press the enter button . But first you need to set your Rx / model into bind function . Most of your tiny little quads will start automatically in bind mode , so all that’s needed to do is after powering the model is to start the bind function . Most of the time this should occur almost instantly and the flashing lights on the quad should go solid to indicate a bind ( same with your Rx ) . But before you do that , Throttle Hold or Throttle Cut . Seen too many Youtube video’s recently of people being eaten by their props , simply because of the lack of a throttle cut or the improper use / set up . Most transmitters give you a start up warning if your switches are in the wrong position ( yes / no ) . Mine do , so I like to have throttle cut set active with the switch in the rearward position . ( Furthest away from you ) . This being the two position switch siting on the left shoulder of the transmitter . Enter the model menu and go to page 10 ( special functions ) . Use the forward button to highlight the first position on the first row and push the enter button . Now toggle the switch you want to use for throttle cut and leave it in the rearward position Next you need to chose the channel you will over ride , throttle is usually channel 3 . Then give it a value of -100 and tick the little box at the end ( highlight then press enter ) .. Then press exit . You have just set up throttle cut and made life safer . To make your throttle work you have to toggle the switch towards you , and if you leave the throttle cut forward then the next time you turn on the Tx you will get a switch warning . 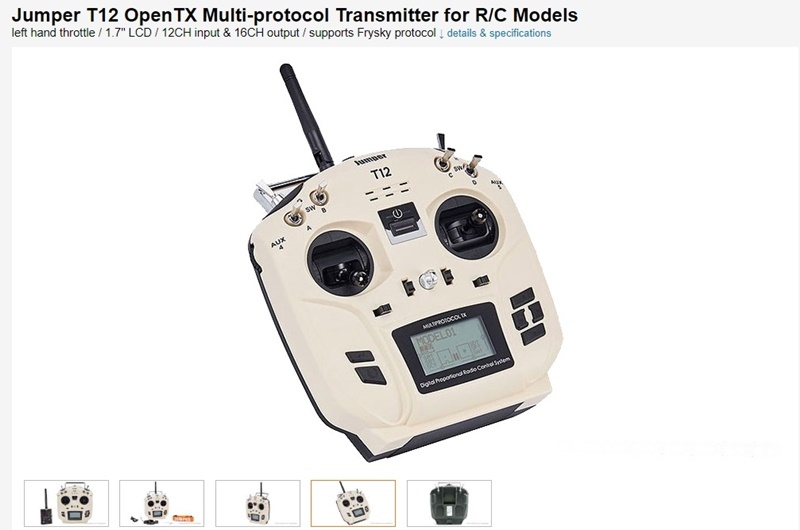 So far I am really impressed and I can see the T12 making for a truly excellent companion transmitter to my Taranis Q X7 . I mean , who wants to lug a full size transmitter about every time they want to fly ? A lot of my micro quads and larger would fly very happily on the T12 and the fact that the transmitters run Open Tx just means operating system familiarity . I have been using the T12 for about a week now doing all sorts of things like Rx testing , binding to micro quads and some servo testing . Having a small easy to use multi protocol transmitter at hand has been really useful I have to admit . So not only is it a RC transmitter but also a very useful tool for the workbench . So far I have only range tested DSM2 and in that regard it matched my Jumper T8 as well my Taranis Q x7 . I will have to do some more comprehensive range testing before ending this review . Last edited by old4570; Dec 07, 2018 at 04:35 AM.